Let the swelling begin... - Really, What Were We Thinking? Tweet Oh, geez. My feet have started to spread & swell. I know, I know...at 36.5 weeks, I should feel lucky that this is my biggest complaint. My back doesn't hurt, my hips don't hurt, I'm not having difficulty breathing...etc, etc, etc. I just really like my dainty little ankles & feet and I want them to stay that way forever. Last night, my right foot looked like it belonged to Fred Flintstone. I'm not kidding. On a very happy note, I had a good 36 week checkup earlier this week. My blood pressure is still great, Klaw's heart rate is excellent, I am measuring just right for my weeks, and he is comfortably head down awaiting the moment when he decides to enter this world. 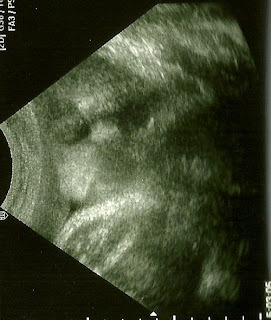 My midwife did an ultrasound and it was amazing. Now that he has put some more meat on his bones, you can really see more of his features - even on the grainy black & white standard u/s machine. During the u/s, he was sucking on his hands and when he finally pulled his hands away from his face, you could clearly see his puffy cheeks & big ol' pouty lips. This was much more awe-inspiring for me than the previous Skeletor u/s pictures.